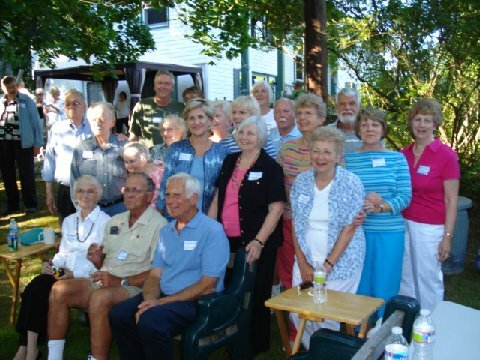 A reunion and picnic for former internees and their families was held August 28, 2010 in Quakertown, Pennsylvania. Anneliese Krakau, nee Busch, former internee and also the widow of internee, Alfred, graciously hosted the event with her daughter. Eb Fuhr, who co-ordinated the event, reports that it was an outstanding success. Over ninety people attended the outdoor event. Most were former internees or their families. They brought photos, documents, and mementos of the experiences they shared. Andrea Krauss, First Secretary, Political Department, represented German Ambassador Dr. Klaus Schariot, delivering his greetings to the group. Other notables included Michaela Kirst, producer of “Zum Nazi Verdammt,” Joe Wendel of public radio in Ohio, and Kathy Jolowicz of Klein Deutschland in Yorkville, as well as Dr. Nishikawa and Mr. Ekeda, representing the Japanese American relocatees of Poston, Arizona. There was also a handful of writers and scholars, eager to learn from those who had experienced internment first-hand. Scattered at tables under tent awnings, attendees spent the warm afternoon reminiscing and catching up on each others’ lives since the long ago days of life in the “camps.” The wonderful food and gracious hospitality provided in abundance by the Krakau family made this reunion so successful that plans began immediately to have another one!